As a stay at home dad, what I really wanted for Father's day was some time out of the house alone. I was lucky enough to get that Sunday morning. Using my copy of Finding Birds in Ireland I decided to head Southeast a bit to County Wicklow and Wicklow Mountains National Park. 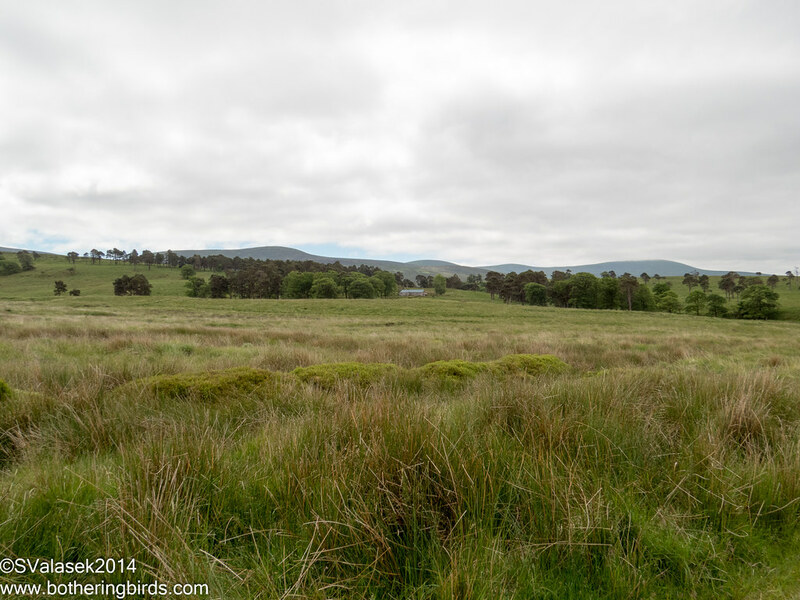 There were 2 places that I wanted to explore, Sally Gap and the Coronation Plantation. 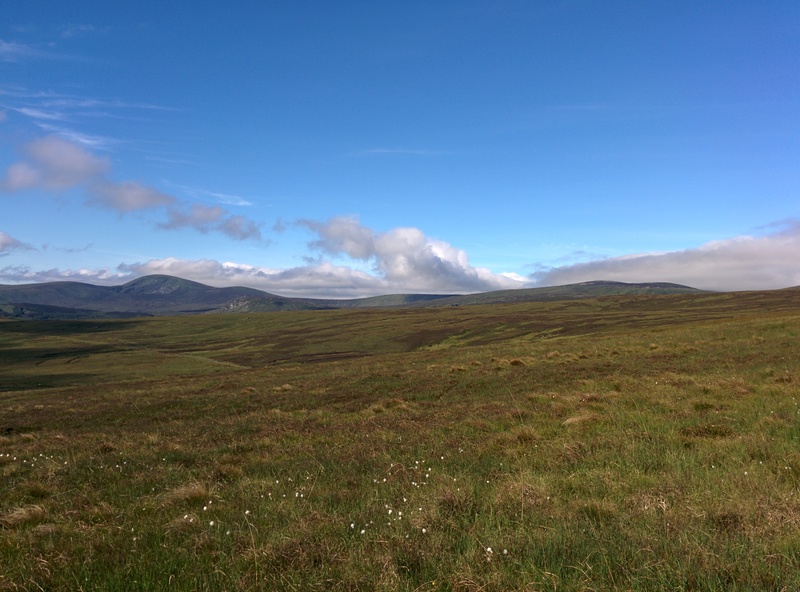 The hills around Sally Gap are known for Red Grouse, but I never did see one, and Coronation Plantation may have Dippers and Whinchats. I got to the area early and it was much more open than I thought that it would be. 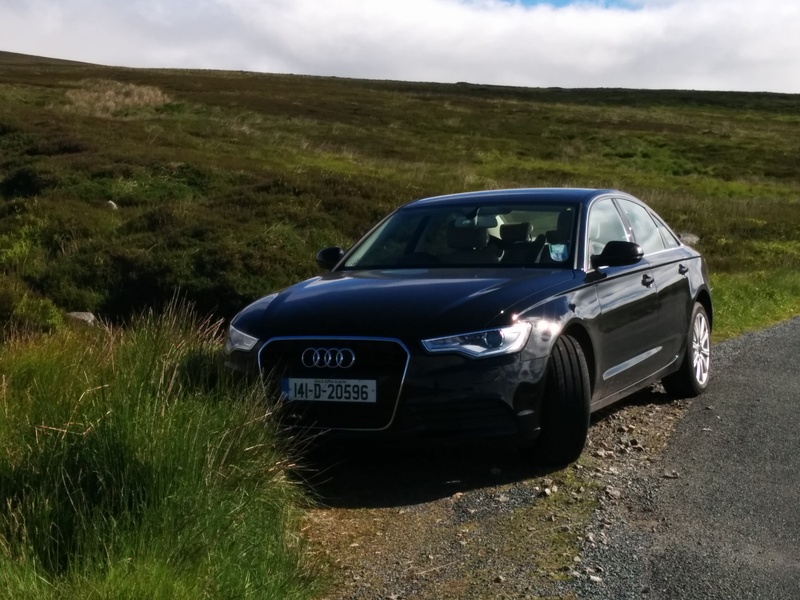 Ireland normally has some of the narrowest roads that I've ever been on, and the roads near here were even narrower. I found the first pull-off that I found and got out to walk around. I left the road on a trail and ran into a guard sheep. Lots of other sheep were nearby. This is a National Park, and I have no idea who's sheep they are. They were all tagged and color-coated. 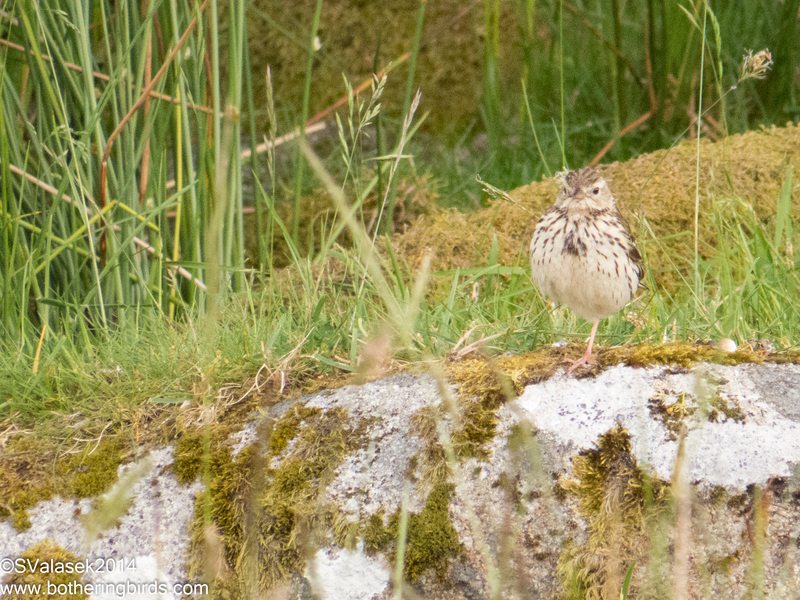 There were some birds around, I saw a lone Wren singing away, but every other bird that I saw was a Meadow Pipit. By the time that I left the Sally Gap area it was a given that anything in the air was a Meadow Pipit, which was a bit disparaging. But they are great singers. 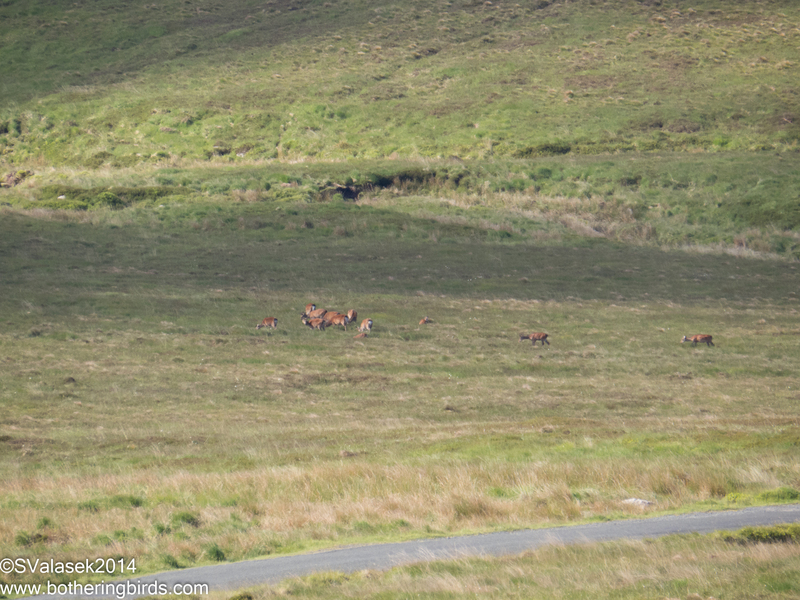 Just West of the Sally Gap crossroads was the best place to see Red Grouse, according to my guidebook. 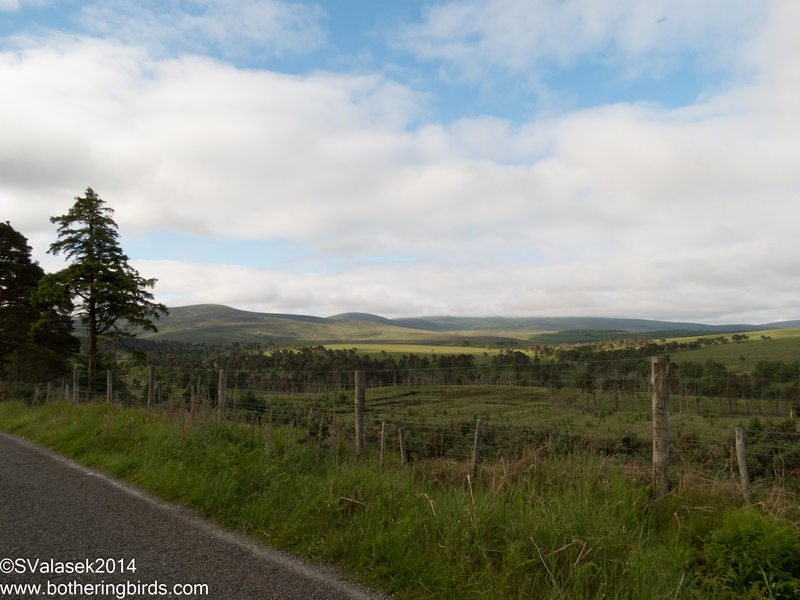 But all I saw was beautiful countryside, Meadow Pipits and bicyclists. 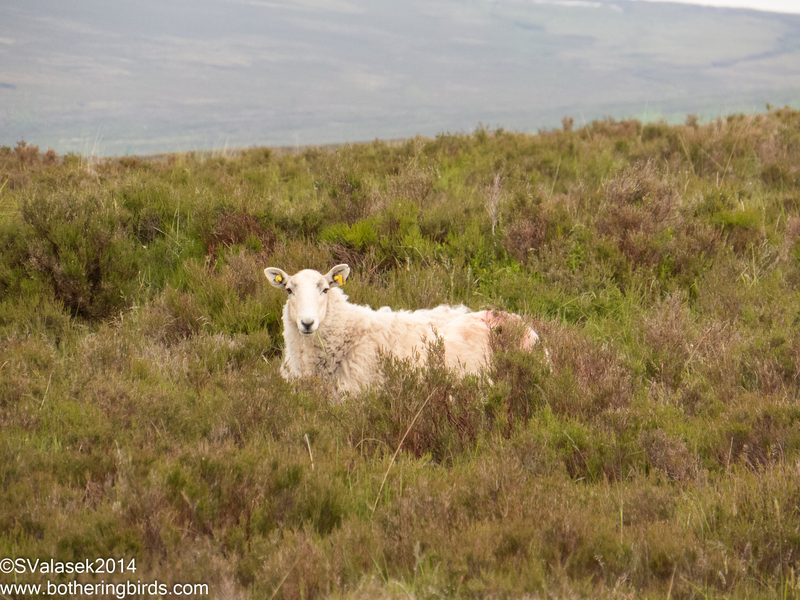 I trudged up the slope for a bit, but I still didn's see any Grouse. And the wind was starting to be something else. As pretty as it was I decided to head towards home and a stop at Coronation Plantation along the way. Before I got back to my car, I noticed some shapes downslope, and on the other side of the road. They were a heard of Sitka Deer. I later learned that these deer are originally from Asia and were introduced for hunting. But they escaped their estate and are now found throughout the countryside. 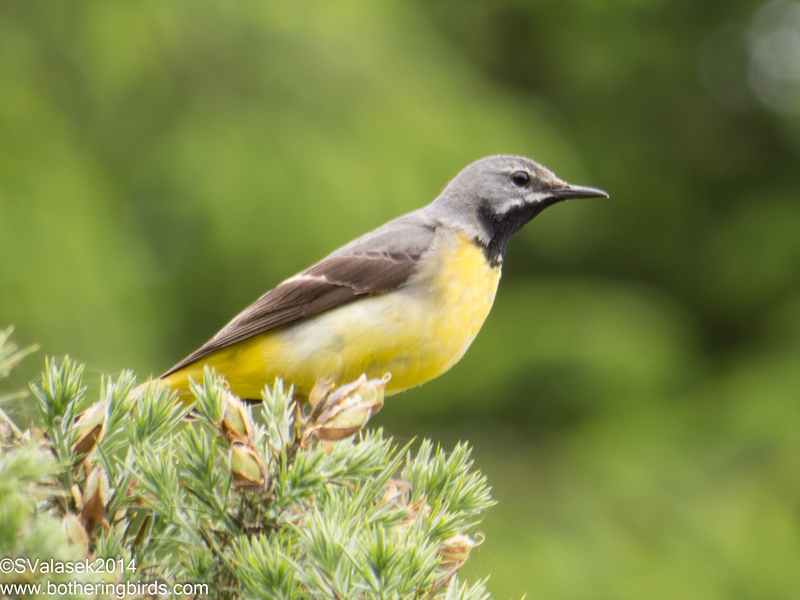 Did I mention how we go birding here in Ireland? The only automatics that they seem to have at Hertz are really, really nice cars. I made my way through the bicycles and sheep on the road and parked at Coronation Plantation. I immediately regretted going anywhere but here first thing. I started to see lots of non-Pipits in the grass and bushes. I'm thinking that I was watching some Warblers across a small stream, but I never got them to sit still long enough for an ID. The Warblers here seem to fill the niche of sparrows in the US and are mostly all brown and tend to be shy. But I kept walking along and found a river filled with various-sized rocks. Perfect Dipper area, with no dippers. I came to a bridge across the river and scanned again for birds on rocks. 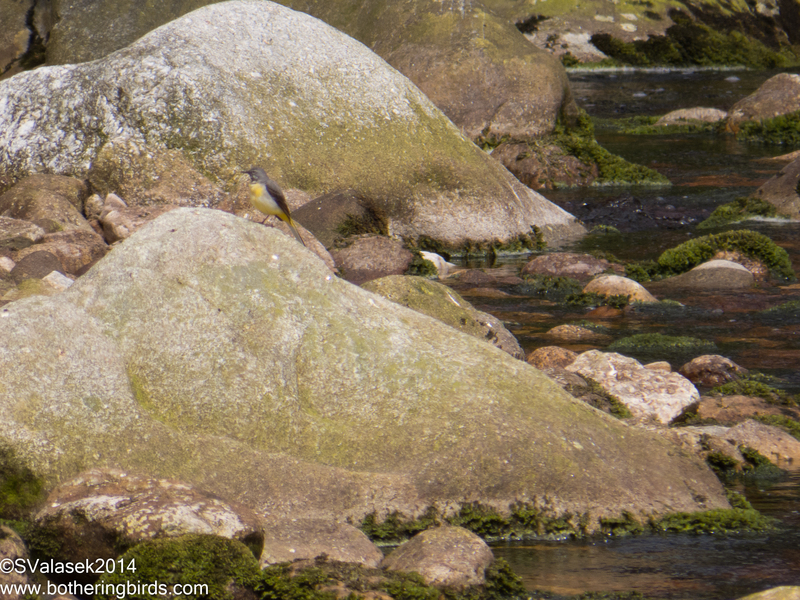 I didn't see any Dippers, but I saw a Grey Wagtail sitting out there. On the other side of the bridge was a fence with a closed gate. There were no signs to tell me where I was, or if I was leaving the park or not, so I decided to stay on my side of it. Apparently it's just a gate and the park keeps going, which I wish that I would have known then. But standing around there I noticed some birds flying though the trees. 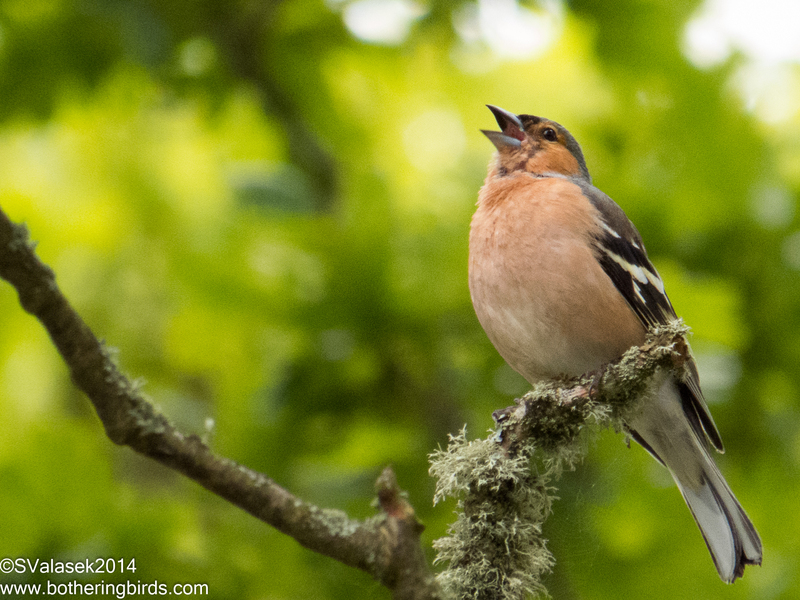 They were a few Chaffinches chasing each other around. The area of Coronation Plantation is really pretty. There is an open field between the road and the creek with some Scotts Pines across the river. The trees were planted in 1831 to try and get some timber business started, but the climate for them was really wrong and no newer trees were ever germinated. Since I dipped on the Dippers, I was looking for another bird that should have been in the area, Whinchats. I thought that I had seen one high in a tree earlier in my walk. But I was heading back to the car when I saw a bird fly by me and land a bit behind me. I turned around and managed to get a photo of it. 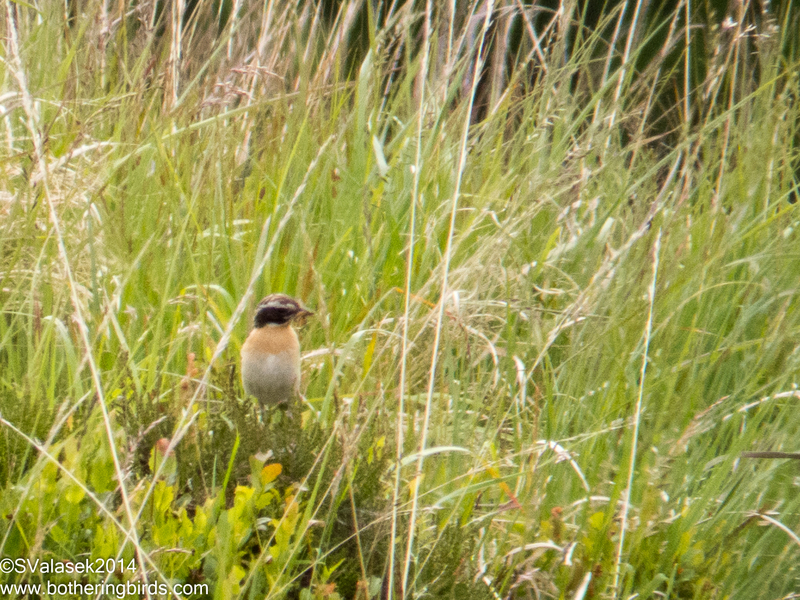 It was a male Winchat. I would see a female nearby too. 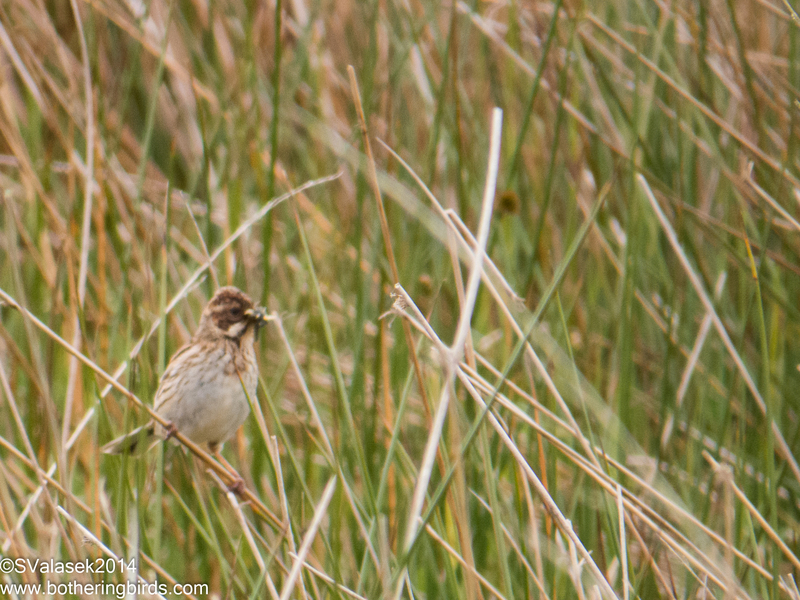 And also near there was a bird that I had seen a few weeks earlier at Bull Island, a Reed Bunting. I tried once again to ID the brown birds off in the shrubs, but I never did. I do plan on going back soon. It's a really nice place to take the kids, not many places for them to get into trouble while I look at birds. And next time I'll go through that gate and explore the Scotts Pines more, there can be Crossbills in there and someone in another blog mentioned seeing Woodpecker holes there once. But I wasn't quite done with the birds yet. On the way back home to Maynooth my Satnav sent me on a very narrow road that had lots of sheep on it. I had to take my time anyway, but I got some nice shots of some birds from the Audi's windows. 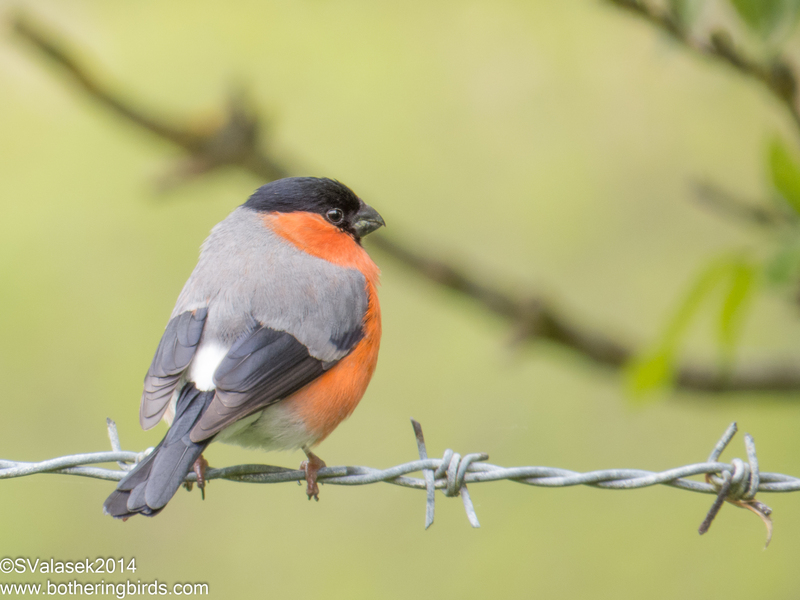 This Bullfinch photo may be one of my favorites. Too bad that branch is in the background. Happy Father's day to my dad, who I really miss, and all you other dads out there. Especially my fellow Stay at Home ones. Cool looking finches you got over there!